It’s a ritual that he has done every morning for the last fourteen years. It’s very similar to the ritual that he witnessed his Dad do every morning for nearly thirty years. I’m sure that his Dad followed the same ritual that he saw his own father do for thirty odd years as well. Out of the corner of his eye, he sees his son watching him. Like any normal man, he puts his pants on one leg at a time. Over his under shirt he puts his neatly pressed dress shirt on. He never saw his father put his protective vest on and he will never allow his son to see him put his on. He doesn’t want his wife or child to be reminded that he works a very dangerous job. It’s the same scenario each morning. He puts his tie on, then his wife walks into the bedroom with a cup of coffee for him. She looks at his tie and tells him it’s crooked. He’ll never let her know that this is his favorite part of the day. She straightens his tie, while teasing him that he should know by now how to tie a tie. With awe, his son hands him his shield. He can still remember his own father tell him why they call it a shield. He is brought out of his pondering thoughts by his son’s voice. “Why do you wear your badge on your left side?” asks his son. He turns to his son and reaches to his left hip for an imaginary sword. It’s a game the two of them like to play. His son has a deep interest in knights and he will do everything to keep his son interested in history. “You know the knights carried a shield, with their left hands?” he asks his son as they continue their invisible sword fight. Their invisible sword fight ends as always, with his son winning with an advance to drive his sword into his father’s chest. He falls on the bed, pretending to be injured. His son falls on top of him, for a big bear hug. “Okay you two - time to go.” his wife calls out. He gives his son a special hand shake that only they know. He hugs his wife tight and gives her a long kiss. They both know the dangers of his job, so this moment is always special. With a tear in her eye, she tells him she loves him and be careful. She says a silent prayer for his safety as she watches him leave. They call it blue blood and it runs deep within his family tree. It takes a special kind of person to become a law enforcement officer. I guess he is one of them. He has seen a lot in fourteen years on the job. He has even lost a fellow officer, to a drugged up nineteen year old. But just when you think you have seen it all, something new comes about. He just wished that people respected the law and officers like they did back when his father served. For the past few weeks, the squad room has been busy with discussion on how to change the public’s perception on Law Enforcement officers. Along with the military, law enforcement officers also defend the laws of the constitution. With the help of the media, the public has a different perception of Police officers. How are they suppose to up hold the law when the media has the public, religious leaders, ACLU, lawyers and congress breathing down their necks. This is not a race war. It’s a war that law enforcement officers have been fighting since they first hit the streets in Boston in 1631. It’s a war on crime and people who commit it. The song was written sixteen years ago by Ronnie Scaife and Phil Thomas. It was Phil’s grandfather and great-grandfather who inspired the heartfelt lyrics, both had served in their local sheriff’s departments. When that old wild west needed taming, a special breed was born. Instilled with courage to walk behind the star. And make us stand for the rights of man, knowing it could mean their lives. But somebody had to draw the line, between wrong and right. Now a days it’s not much different. Just the uniforms have changed. Good folk need protection, where evil still remains. So God bless all the women and men sworn to up hold the law, and thanking for the the fallen ones. The ones who gave it all. It’s just a piece of metal, until it’s pinned upon a chest. Then it becomes a symbol of America’s best. Many people believe that their jobs are the hardest jobs in the world. But, nothing comes close to having the job of being a law enforcement officer. I should know - for a short time, I too had served as a law enforcement officer. A law enforcement officer is a combination of an Emergency Medical Technician, a lawyer, a mechanic, a mother or father, a role model, a mediator, a councillor, a life saver and more. When you put on that badge, you are constantly scrutinized. The first thing I was taught was to protect myself and then protect the public. I was also taught never to eat in public, yes - especially donuts! I was also taught that I had to watch every move I made, every word I said and everything I did. We had to be the most perfect humans and could never ever make mistakes. What got me out was the politics. To me the law is in black and white. If you break the law, you must pay for your crime. Even when I served in the early 1990’s and more so today, the law is all in a gray area. ‘You can’t arrest this person, because they are the son of so and so...’ even though they broke the law. Would I serve today? Not even if my life depended on it! Do not judge a law enforcement officer, until you have walked miles in their shoes. Law enforcement first arrived in America in Boston in 1630. The first officers were known as ‘watchmen’ as they were made up of volunteers who patrolled at night to report fires and maintain order in the streets. The first American officer to be killed in the line of duty was Sheriff Cornelius Hogeboom. Sheriff Hogeboom was shot and killed while serving a writ of ejectment on October 22, 1791, in Columbia County, New York. Since then over 20,000 officers have been killed in the line of duty. Although we lost officers in the Oklahoma bombing as well as the events of September 11th, the single deadliest year for officers was in 1930 with 301 officers killed. 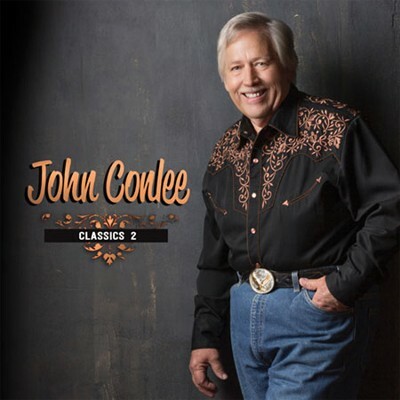 It’s John Conlee’s classic vocals mixed with beautiful harmonies that draws the listener in. From the first few notes of the opening song, “Domestic Life,” you are drawn to a time when music was real and contained heart and soul. John includes one of his favorite songs on this incredible album, “Bread And Water.” Written by Vince Gill and Leslie Satcher, this song captures the story of redemption and salvation of one man. Although Conlee’s version is well done, I’m still partial to the original version that Vince Gill recorded. Other songs include “Love In The Real World,” “Sure” and “The In Crowd.” Performed in the classic Conlee style, “The In Crowd,” is a classic country song that talks about the importance of family over friends. There are four songs on this album that we pulled to hit our list of Top Songs of 2015, while earning a nomination each for the Spirit Award’s Song of The Year Award. “Walkin’ Behind The Star,” hits the list for it’s powerful message mixed with gentle melody. “Stuff That Works” is another that hits the list. Sometimes we have to simplify our lives to find what’s important to us. This song points out those things. Where as “A Lot of Things Different” takes us on a journey of life’s regrets. Written by Bill Anderson and Dean Dillon, this heartfelt storytelling ballad makes the listener think about all the events that have taken place in our individual lives and how we may have done things different. John performs this one with such heart and soul it reverberates through the speakers. The final song to hit our list is “Pocket Full of Crosses.” This non-traditional Gospel song is one that captures the true meaning of what being a Christian is all about. As a Christian, this one get’s you thinking about your own beliefs as well as your actions. For over thirty-six years, John Conlee has been entertaining us with an amazing array of real country music. He draws on his Christian beliefs and his Kentucky farm upbringing to bring forth an inconceivable collection of songs that everyday people can experience and relate to.